Outwardly Mattie Kenny displayed a coolness that suggested he was the least surprised person in Thurles on Saturday but there was no disguising the significance of Dublin's victory. 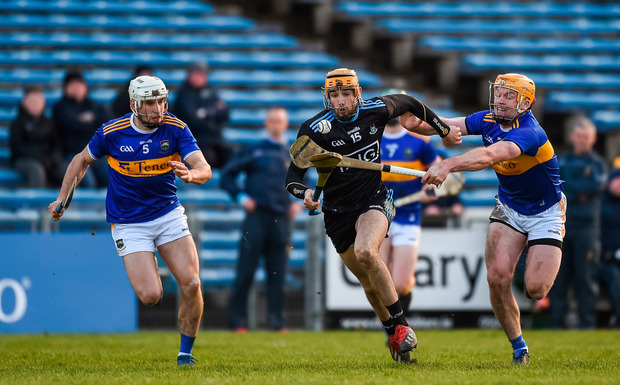 Dublin's last win against the Premier county on Tipperary soil was in 1946 but most recent experiences of Thurles against the home team had been gruesome. "We were actually looking forward to going on the road this week," shrugged Kenny, whose team face All-Ireland champions Limerick in Nowlan Park (1.30) in the League semi-final next Sunday as a consequence of Saturday's win. Both landed monstrous first half, wind-guided points while Moran held his nerve in the second half, pristinely striking crucial late placed-balls directly into the Thurles gale. John McGrath lasted just 35 minutes in Chris Crummey's zealous company. Daire Gray kept 'Bubbles' O'Dwyer scoreless. But it was Dublin's response to each Tipp fight back (they levelled the match three times in the second half but never led) that will please Kenny most, particularly their newly-acquired ability to win tight matches. "Last year's Championship was super," Kenny pointed out. "We saw sizeable leads being wiped out every week. Most of the games in last year's Championship were won in the last five, six, seven minutes. "It's something that every team has to be able to do, to manage the game coming down the stretch." Paul Ryan scored two points in that decisive period off the Dublin bench. 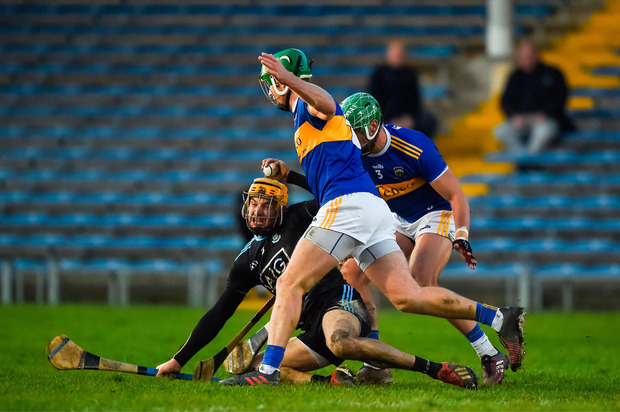 By that stage, John Hetherton's arrival had not only given Alan Nolan something to aim at as Tipperary attempted to hem Dublin in against the wind, the St. Vincent's man had also got the better of Pádraic Maher. "It's all down to the players," Kenny added. "Their work ethic and how they're working for one another." Tipperary meanwhile, continue to puzzle. The frozen, huddled congregation in Thurles on Saturday left town still wondering as to the true personality of this team. Was it the one that hit 18 wides against Dublin or is it closer in appearance to the one that clinically took Cork apart in Páirc Uí Chaoimh six days earlier? "We hurled the finest so we don't have any complaints," he stressed. "Mattie Kenny and his team came down, they had a plan and they hit us hard in the air and won good ball and they were winning the breaks. "When you win the breaks, the ball in the air and the tackle count, you are generally in a really good place and we paid a heavy price"
Brendan Maher made his comeback from the cruciate ligament injury he suffered last May while Shane Barrett's repatriation with the Tipperary full-back line has installed a gear they were missing last summer. Yet, though each individual component of the Tipp attack had it in them to cut loose, collectively they lacked a general cohesion and emphatically lost the aerial battle. "I have seen enough to know that if we find our flow for long enough in games then we will have a real chance," suggested Sheedy." SCORERS - Dublin: E Dillon 1-3, S Moran (3f, 1 '65), O O'Rorke (4f) 0-5 each, C Boland, P Ryan 0-2 each, E O'Donnell, C Crummey, J Malone, R McBride 0-1 each. Tipperary: J Forde 0-7 (6f), N McGrath 0-4 (1f), J Morris 0-3, M Kehoe, Callanan 0-2 each, R Maher, M Breen, N O'Meara, J McGrath, B Maher (f) 0-1 each. DUBLIN: A Nolan 7; P Smyth 8, E O'Donnell 9, D Gray 7; D O'Connell 7, S Moran 9, C Crummey 8; R McBride 6, S Treacy 6; C Conway 5, D Sutcliffe 6, J Malone 6; F Whitely 6, O O'Rorke 8, E Dillon 8. Subs: C Boland 7 for S Treacy (h-t), J Hetherton 7 for Conway (h-t), P Ryan 7 for Whitely (56), R Hayes 6 for Malone (61), D Treacy 6 for O'Rorke (69 inj). 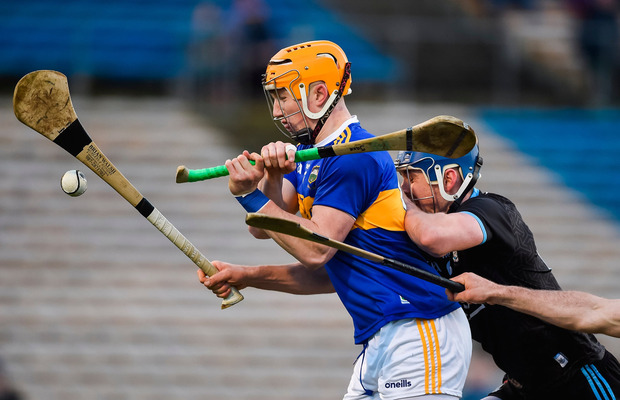 TIPPERARY: P Maher 6; C Barrett 8, J Barry 6, Joe O'Dwyer 6; R Maher 7, Pádraic Maher 7, R Byrne 5; N McGrath 7, M Breen 7; J McGrath 5, S Callanan 6, N O'Meara 7; John O'Dwyer 5, J Forde 6, J Morris 7. Subs: Patrick Maher 6 for J McGrath (35), B Maher 7 for Byrne (47), M Kehoe 7 for John O'Dwyer (57), A Flynn 6 for Breen (61), D Maher 6 for N McGrath (73 inj).